Floss Threaders work like a needle threader for sewing. You put the floss through a loop at the top and then thread the pointy part under or over the wire (depending on whether you’re flossing top or bottom teeth). 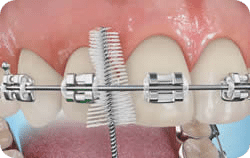 Once threaded, you can floss that space like normal. Then just repeat for each space until you’ve got a clean, tartar-free mouth. Proxy Brushes are lifesavers for cleaning teeth with braces. These are tiny little cone-shaped brushes that fit under the wire and between the teeth to remove buildup. WaterPiks are the fanciest flossers for braces. You simply point the flosser tip between your teeth and along the gum line, and it sprays high-pressure water into the spaces between your teeth, removing hard to reach buildup. If you just can’t get it, you’re welcome to stop by Glaser Orthodontics near Mohegan Lake, NY and we’ll show you how to floss with braces quickly and efficiently. And as always, if you have any questions or concerns Dr. Glaser is your guy! He can be reached at 914-739-6400. Keep smiling!